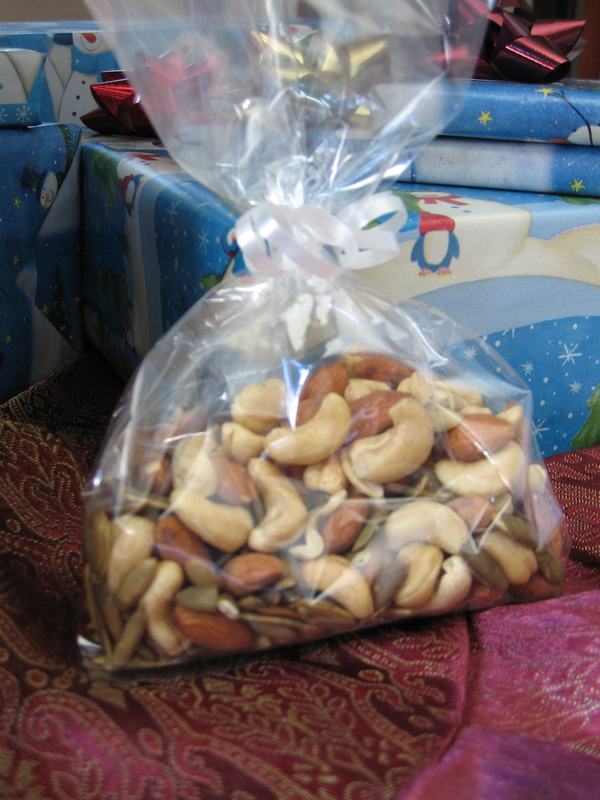 Spicy Cashews, almonds and pumpkin seeds. Homemade gifts for family and friends make me smile–they are thoughtful, personal and unique. I love giving and receiving them! And who doesn’t like giving gifts? Here are some nourishing warm fuzzies to share with your loved ones this holiday. Hugs! 1. Spicy Nuts Choose a variety of nuts and seeds, toast them in a skillet until lightly brown, then toss them with olive oil and your favorite spices. Add Golgi berries for a sweet kick or just keep it all spicy. Place them in a bag with a pretty bow or in a festive tin. 2. I Burned You a Mixed CD Oh, yes… this may bring you back to 1998, but it’s all good. Make a playlist of your favorite exercise songs and burn them onto a disc. 70 minutes of booty shakin’ good lovin’ right there! 3. Turtle Smoothie in a Jar Instead of filling a mason jar with homemade chocolate chip cookie ingredients, fill the jar with 2 servings of your favorite protein powder, 3 Tbsp raw cocoa powder, and 1/4 cup raw pecans. All they have to do is add 4 Tbsp peanut, almond or sunflower seed butter, 12 oz almond milk, a banana and 12 oz ice. Tie a cute bow around the jar with the recipe attached. Makes 2 smoothies. 4. Couples Coupons Are these über cheesy? Yes. Are they completely awesome if you are the recipient? Heck yes! Design coupons and print them out on card stock. Fill in your own gifts of massage, foot rubs, cook their favorite healthy dinner, go on a walk, etc. Have fun and spoil your loved one! 5. Fruit and Vegetable Wash This is perfect for your veggie lover friends! Find a cute or fun spray bottle and fill it with 1 cup of water, 1 cup apple cider vinegar, 1 Tbsp baking soda and juice of 1/2 lemon. As always, attach the recipe so they can refill it and use it time and time again. 6. Take the Chill Out Chili in a Jar Nothing says “Happy Holidays” like homemade warm and cozy soup! Use your favorite chili (or other signature soup) recipe and place all of the spices in a mason jar. Tie a bow around the jar with the recipe attached.